Bunhill Fields was the main burial ground for Friends (Quakers) in the London area until 1851. George Fox is among those buried there. 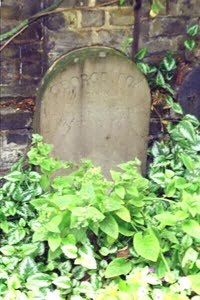 Bunhill Fields was in a very poor section of London, where very few Friends lived. In the last half of the 19th century, Friends engaged in evangelical outreach to the area. They started with tent meetings, which drew large numbers of people. They also served the needs of area residents with a variety of social programs, including an adult literacy program using the Bible. People reached by this ministry (and similar ministries elsewhere) were placed by London Yearly Meeting of the Religious Society of Friends (Quakers) in a new class of membership called associate members. Many current London-area Friends are descendants of these associate members. At Bunhill, there developed a recognized Preparative Meeting (name for a local congregation among British Friends). Friends built a meetinghouse there. The worship room had the words of John 3:16 written in large letters on the wall. Much of the meetinghouse was destroyed during the bombing of World War II, so the current meetinghouse is only a portion of the original. 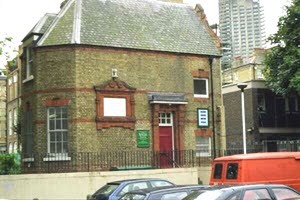 Ministries like those at Bunhill worked together in an association. This association is now called Quaker Social Action, and has its headquarters at Bunhill. However, it no longer has an evangelical emphasis.